Many people do not know how to calculate age? Some people know Arthemetics very well but they don't know what is the precise formula for age calculation? Some online tools and application you will get for this calculation. The birthday or age formula is very easy. Yet, Some people manage application for single use and waste lots of time. But think, when you are in a competitive exams hall, then what you will do for it? Don’t worry, we are with you. Here, we are presenting the age calculation tricks in easy language. You can calculate age using many methods, but here, we are giving you an amazing method that will be helpful and efficient for your personal works or competitive exams. Simply, we subtract lower value from the higher value. But here we got the age values in three units- these are years, months and days(Even sometimes we got Hour, minute and second also). Year, month and days are the main problems for this procedure. Because the units can be converted by multiplying or dividing by three different values, not like the 1 & 0 methods. But here, Year can be converted to month multiplying by 12 and convert year to days by multiplying 365. The month can be converted into day multiplying by 30. In the age calculation, this is the major problem. But here, we will not convert factors. We will just convert some value according to our need. Before moving to our main formula or method, here we are presenting an example age calculation which will give you the real idea of how to calculate age in a simple way. 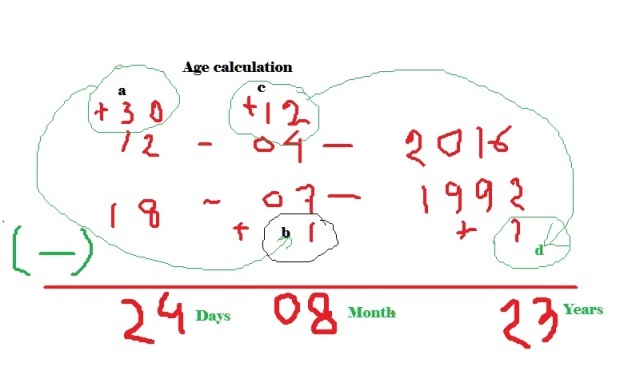 In the above calculate age procedure, you can see that we have added 30 days because we cannot subtract 18 days from 12 days, (though we can subtract 18 from 12. but the subtracted value will be negative). So we added 30 days in upper value. To keep the balance we also added 1 month in lower value because 1 month is equal to 30 days. In the same way, we also added 12 months in upper value because we could not subtract 07 months from 04 months, that’s why we added 1 year in lower value. Because 12 months = 1 year. Finally, we got the upper value as the greater value than the lower value in all section. (i.e Day, Month and Year ) Now we can subtract every value and every value will be positive. Also, see that we do all operation one after one from a to d.
Hope you have understood very well how to calculate age. 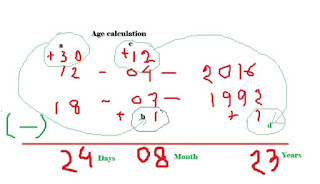 Also, we hope you are now able to calculate age easily by Age calculation tricks. Yet, if you have any problem to understand then feel free to ask in the comment box. Don’t forget to share your friends because who knows that some of your them may need this formula for calculation age.